Ron Brunton revives a long neglected problem posed by the great anthropologist W.H.R. 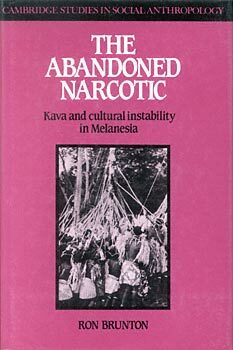 Rivers in History of Melanesian Society (1914): how to explain the strange geographical distribution of kava, a narcotic drink once widely consumed by south-west Pacific islanders. Rivers believed that it was abandoned by many people even before European contact in favour of another drug, betel, drawing his speculations from the ideas of the diffusionist school of anthropology. But Dr Brunton disagrees. Taking the varying fortunes of kava on the island of Tanna, Vanuata, as his starting point, he suggests that kava's abandonment can best be explained in terms of its association with unstable religious cults, and not becuase of the adoption of betel. The problem of kava is therefore part of a broader problem of why many traditional Melanesian societies were characteristically highly unstable, and Dr Brunton sees this instability as both an outcome and a cause of weak institutions of authority and social coordination.